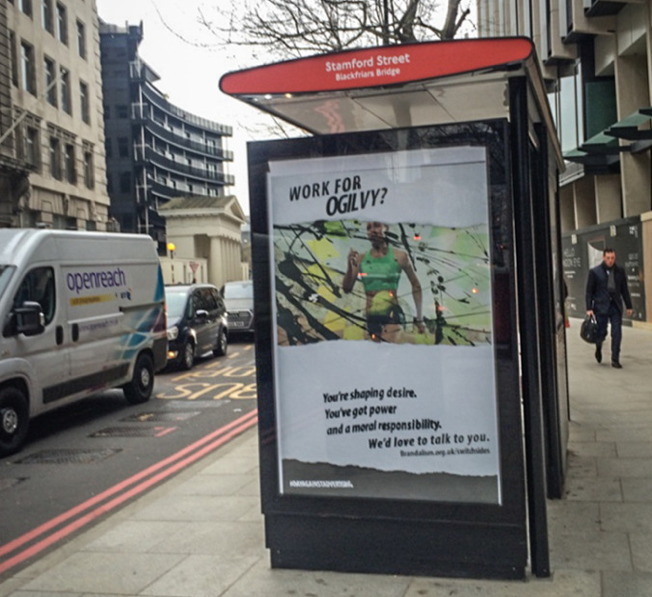 This morning, on the way to work, the employees of a few major United Kingdom-based ad agencies came across a message meant just for them. 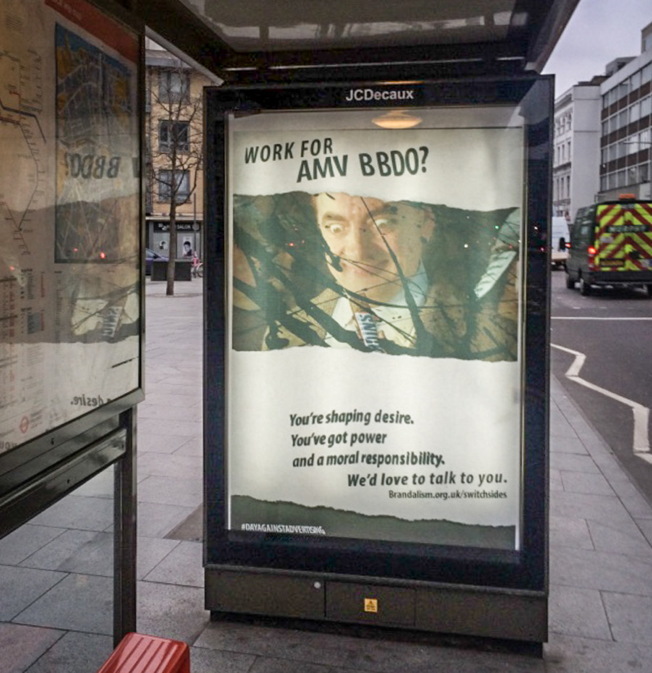 Just in time for International Day of Action Against Advertising on Friday, artist network Brandalism's gone guerrilla again: It's erected posters in bus shelters just outside Ogilvy, JWT, AMV BBDO and TBWA Manchester, with the images referencing ad classics. "Work for TBWA?" one reads. "You're shaping desire. You've got power and a moral responsibility. We'd love to talk to you." The ads drive people to Switch Sides, a Brandalism subsite. "We speak with people who work in corporate advertising all the time," the site says. "Many are close friends, and express regular existential doubts about the work they do. 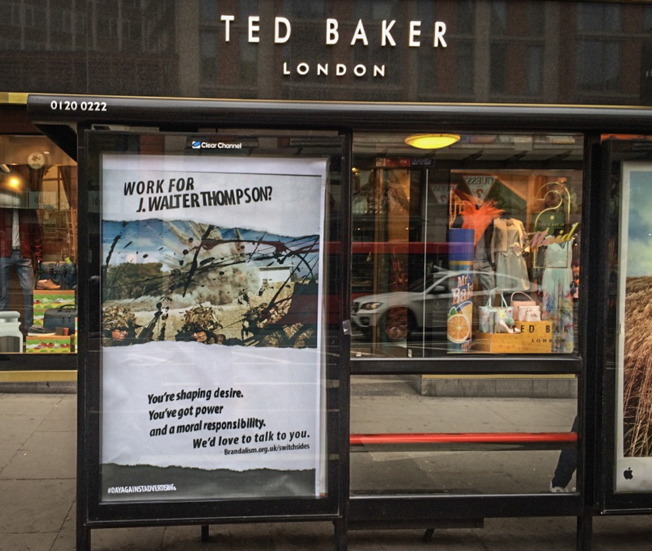 Huge industries of artistic labour, and multi-million pound budgets—all in the pursuit of… what? Another leather sofa? The latest airline deal to Rome? Your creativity could mean so much more." Right now, the world faces multiple social and environmental crisis. Our rent is unaffordable, wealth inequality is growing, thousands are drowning in the Mediterranean sea and the climate is destabilising at a faster and faster rate. We cannot consume our way out of these problems. We need your skills and your passion. 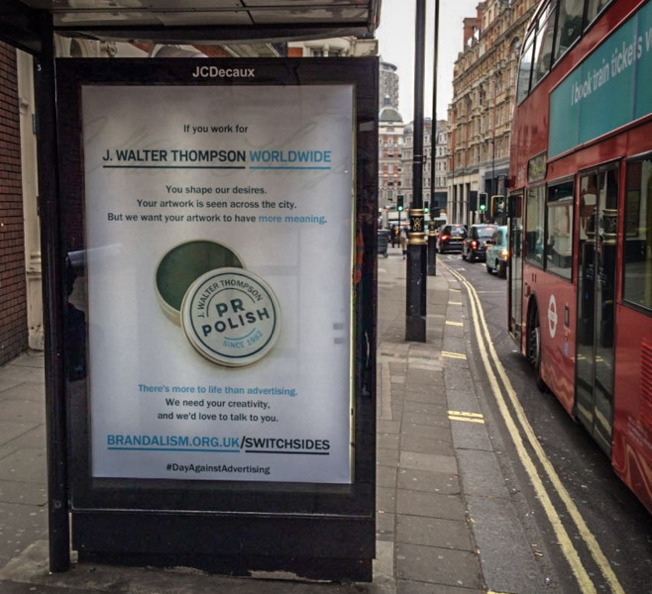 Not to sell us more Snickers bars or BP's latest sponsorship deal… but to change the world. We need more art directors, copywriters, strategic planners, graphic designers, 3D artists, developers and project managers. We need all of you. We have a battle to fight. But this not a battle against desire. We want more from life, not less. 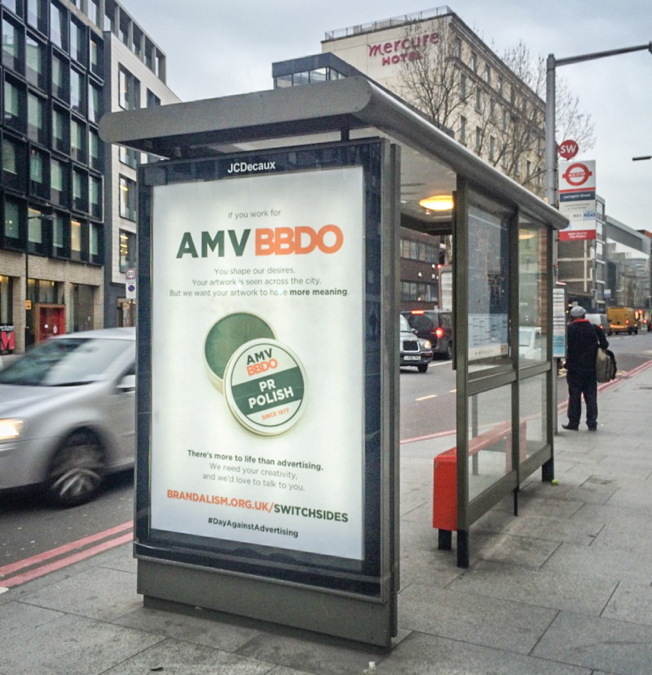 This Friday 25 March 2016 is an international day against advertising—called by our friends in France. It's a perfect day to consider what you do for a living and your role in the world. You might think, "It's easy for your to say, but I need to earn a living." And you're right, it's easy for us to write these words. Conversion, as all advertisers know, is not a simple process. We have mortgages to pay, children to support, parents to satisfy and status to uphold. We know these pressures. Many of us have worked in the industry. But we escaped the shackles of commercial marketing and fled to the worlds of community activism, environmental sustainability, refugee solidarity and artistic-political praxis. Although just a first step, confronting our responsibilities has allowed us to prioritise our personal beliefs over our corporate, career-driven selves. The sense of relief was astonishing. If you'd like to continue the conversation, then please get in touch with the email address at the bottom of this page. We promise to protect your anonymity. Where and how we take things from here, we're not quite sure. "The advertising industry has a profound impact on our values and what we consider important in life," said Brandalism's Robert Marcuse. "The skills of thousands of creative people are needed not to sell us more stuff, but to overcome the multiple social crisis of our times such as climate change, social inequality and child poverty. We want to start a conversation with those working in advertising about how we move beyond consumption and economic growth." The organization also says that many of the ads were posted by former ad folk. On joining Brandalism, former creative Cynthia Philips adds, "I just didn't want to have to tell my grandchildren that I just stood at the sidelines when so many serious issues were going on around me." The first celebration of the day was last year during the World Social Forum in Tunisia. This year, French association Résistance à l'Agression Publicitaire is taking up the call to arms. The date commemorates a French court decision in 2013 that deemed a group of anti-ad activists as not guilty of "degredation" after they spray painted billboards in 2009. They were acquitted in the name of freedom of speech and "reason of necessity" against ad oppression. 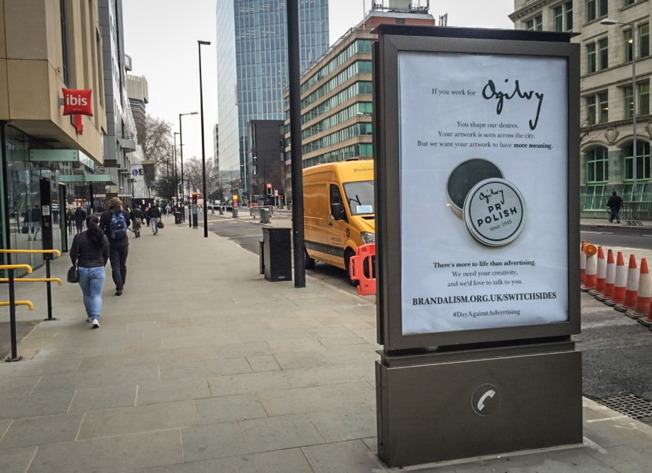 Late last year, Brandalism's team slathered the city of Paris with 600 fake ads ahead of the COP21, highlighting the environmental hypocrisy of brands vaunting their active involvement. More creative variants appear below.